To detect developmental problems and help parents make sure toddlers' teeth and gums are cared for properly, we recommend that your child visit us beginning at age 1. At this age, we review proper home care with the parents to get the child off to a good start. It is important that your child's first visit be a pleasant experience, and we will try our best to make it so. As your child nears the age of 3, please be prepared to let your child enter the treatment room alone. 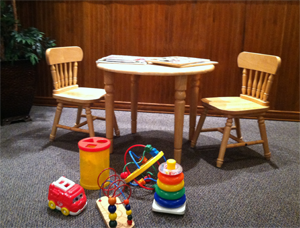 Children are almost always more cooperative if the parent waits in the reception room. Thank you for your cooperation. Familiarize your child with the dentist and dental office by taking him or her along with you or a friend. Let your dentist know in advance to allow time to get acquainted. Be low key about the visit. Your child has no reason to be afraid unless fear is suggested. Take cues from the dentist, who's experienced at dealing with children, and don't expect perfect behavior from your child.